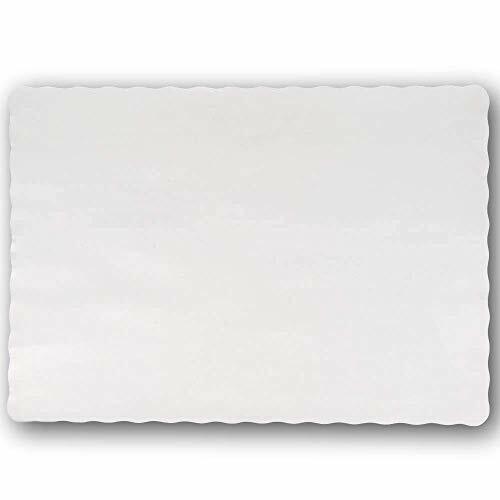 An ideal addition to home, casual restaurants, diners, and healthcare facilities, this placemat is sure to help you dress up your dining room tables or food trays. Not only does it provide a sanitary, individual dining surface for family, customers and guests, it helps protect surfaces from scratches, unwanted spills, and messes. Made from convenient, disposable paper, this placemat makes setting tables simple. It helps to protect tables from spills and messes so that your waitstaff can easily clean them between uses. Plus, it also reduces the chance that rough bases on chinaware can scrape your table tops. 200 pack, 14" x 10" white color, conveniently disposable, great for every day use at home or in restaurants. Protects tables from spills and messes, offers family and guests a sanitary, individual place to eat. Made from paper material, food safe, compostable, eco-friendly and recyclable. Decorative, scalloped edge, excellent for decorating tables at parties, festivals, restaurants or catering events. View More In Table Covers. If you have any questions about this product by Fit Meal Prep, contact us by completing and submitting the form below. If you are looking for a specif part number, please include it with your message.